Welcome to my first review of 2014! Zoya recently announced their latest promo they begins Jan 7th, so why not start of with a Zoya you might want to add to your basket? I know when it comes to January, I'm already eagerly awaiting spring collections, but I'm not quite ready to throw in the winter towel yet. I love dark shades for fall and winter, but come January I like to throw in some "icy" shades into the mix. Soft blues, purples, and some cool-toned metallics fit the bill. Zoya Hazel has just become my latest pedicure color and it's cold as ice! Hazel is a pale blue foil with golden foil flecks. Color: Like I said, cold as icy! I love the foil finish of this pale blue. The golden flecks give this color a little more depth and keep it form being flat. Price: $9.00 on the Zoya website. BUT, with the promo next Tuesday you can buy this one, plus 2 others for just $12! Read about the promo here. Overall: I love this color. This is exactly what I crave in Janaury. 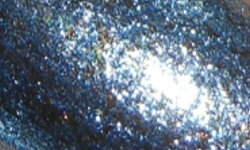 The color is crisp, shiny, and has an excellent formula. No complaints! This is really pretty on you Stephanie! The Zoyas all went up to $9 on their website. :( This is so pretty, but I already have Crystal, which seems very similar. I wish they would make something just like this, but with a base color other than blue. If they do, I haven't found it! Hazel was one of my favorites last year. Looks beautiful on you! I really like those golden flecks!! What an awesome look for this time of year! Thanks for reminding us about the upcoming promo! I would love see this finish with other colors! I love Hazel! Such a pretty polish! I have Crystal (of course) and FeiFei and wondered if I needed Hazel...still not sure, but it sure looks pretty on you. I does look icy and I like it.